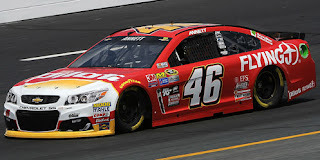 Michael Annett picked up the 3rd last-place finish of his NASCAR Sprint Cup Series career in Sunday’s Bad Boy Off Road 300 at the New Hampshire Motor Speedway when his #46 Pilot / Flying J Chevrolet fell out with steering issues after he completed 236 of 300 laps. The finish, which came in Annett’s 98th series start, was his first of the season and first in a Cup Series race since last September at Richmond, 38 races ago. 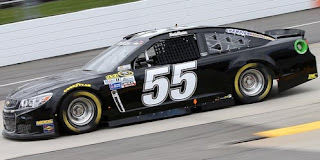 It’s also the second last-place finish of the year for HScott Motorsports’ #46 team, which trailed Bristol last month. 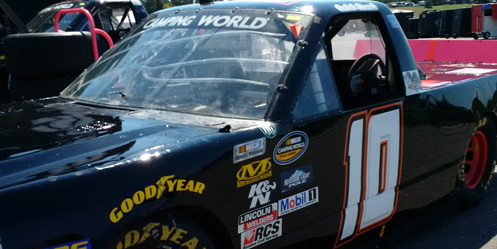 That day, Justin Allgaier was tabbed to relieve Annett, who was battling flu-like symptoms. Annett’s struggles at Bristol captured what has been another difficult season for the third-year driver. The Iowa native came into Loudon a distant 37th in points with just one finish inside the Top 20 - a 20th-place run at Daytona in July. 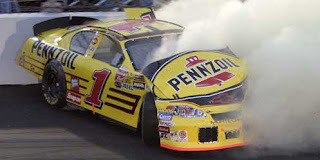 Three accidents during a five-race stretch were his only DNFs of the year, but the first was a hard crash at Talladega when he hit the inside wall flush with the driver’s side of his car. 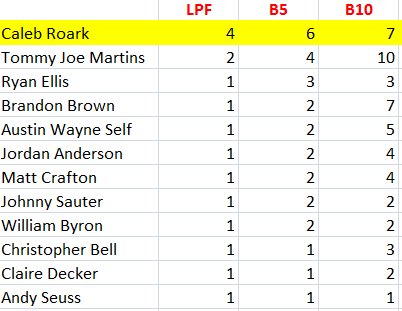 In five previous starts at Loudon, he’d finished no better than 29th on two occasions, and was 33rd in the spring, though he’d managed to finish all of them under power. At the same time, longtime sponsor Pilot / Flying J Travel Centers has remained steadfast in their support, including cross-promotions with this month’s “Battle at Bristol” college football game and the St. Jude Iowa Tournament of Hope. Annett timed in 36th in Friday’s opening practice and secured the 35th starting spot for Sunday’s field with a lap of 131.528mph. He then ran 36th in both Saturday’s practices. 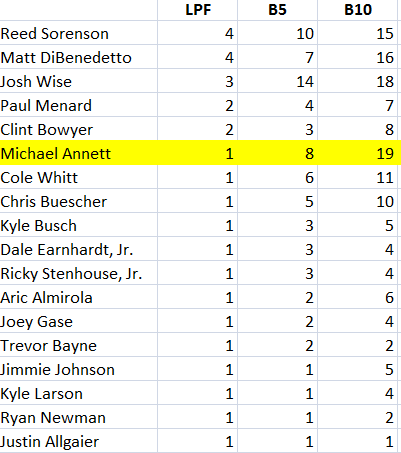 For the 21st time in 28 races this season, no drivers were sent home, and Annett’s Charter - acquired from Premium Motorsports’ #98 over the offseason - would keep him in the field. Starting 40th on Sunday was rookie driver Jeffrey Earnhardt, who again drove the #32 Can-Am Ford for Go FAS Racing. He was joined at the start by Kasey Kahne, whose #5 Great Clips Chevrolet needed a new motor for its driver-controlled track bar adjuster. 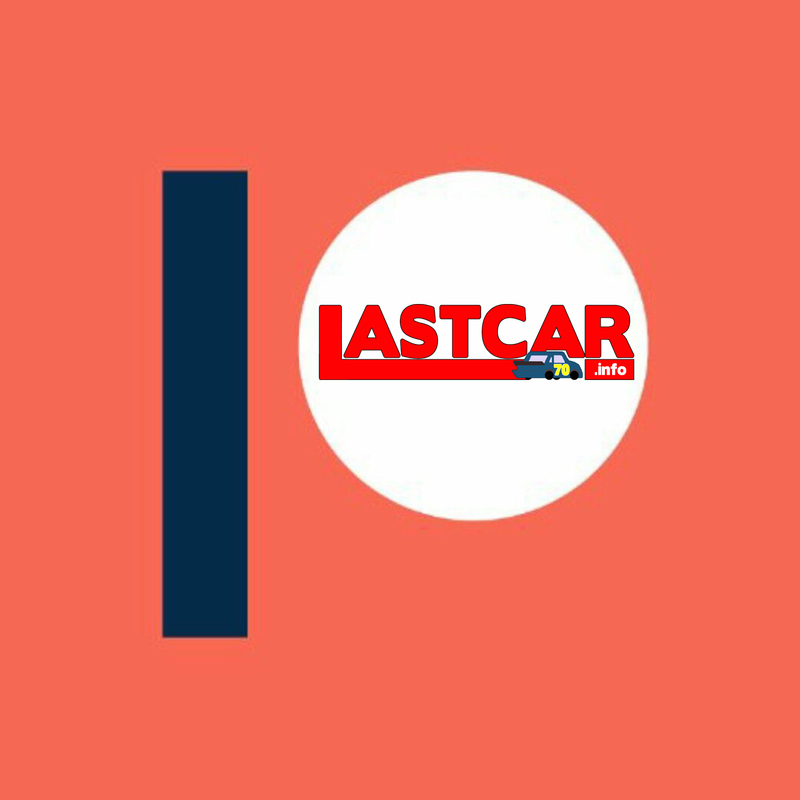 The post-inspection change incurred a penalty that made Kahne surrender his strong 3rd-place starting spot. 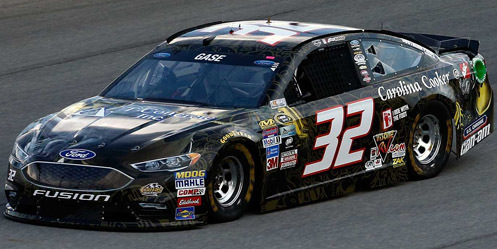 By the end of Lap 1, both Kahne and Earnhardt had passed the #30 Curtis Key Plumbing Chevrolet of Josh Wise, who slowly began to lose touch with the field. 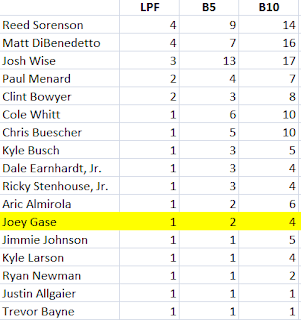 Wise trailed the most recent Cup race at Loudon in July. 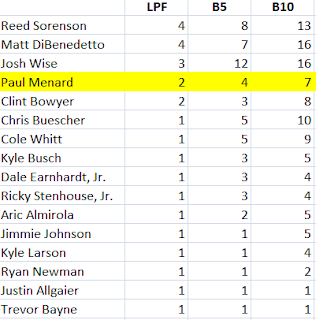 Earnhardt re-took 40th from Wise by Lap 12, and on Lap 16 both Earnhardt and Wise were all by themselves, 3.5 seconds behind the rest of the field. Still 40th on Lap 19, Earnhardt was the first to be lapped by polesitter Carl Edwards. 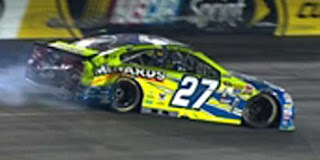 As Edwards’ #19 Comcast Business Toyota made its way past, NBC Sports’ broadcast showed Earnhardt’s #32 had white rims. This may indicate that Earnhardt was scuffing tires for fellow Brad Keselowski, the only other Ford in the field running white rims. Pit stops to change these tires may account for Earnhardt’s rapid loss of laps. He was two down by Lap 42 and three down on the 63rd. On Lap 73, the leaders’ green-flag stops brought a new contender into the mix: Cole Whitt in the #98 Standard Plumbing Supply Chevrolet. Whitt, along with fellow “Open team” drivers Wise and Reed Sorenson, had also lost laps in the early stages and were running in positions 37-39. 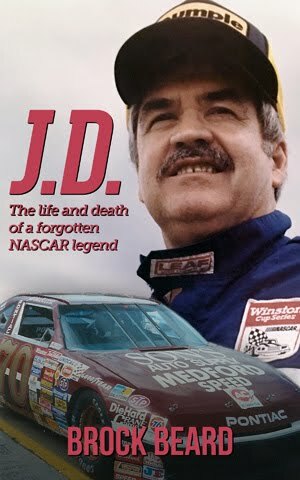 Earnhardt lifted Whitt from the spot on the 76th circuit, then Wise on the 78th. 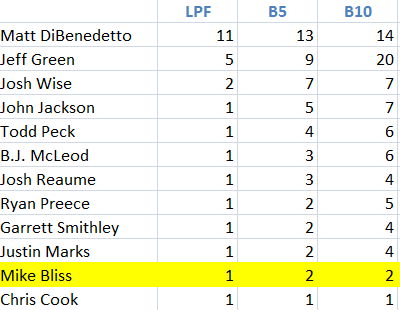 By Lap 100, last-place Wise’s #30 Chevrolet was five circuits behind, and by Lap 113 was down six. When debris forced the first caution on Lap 124, Wise was slow, apparently struggling with faulty jack screws that made the car’s underbody bottom out. The Motorsports Group team brought Wise behind the wall under the yellow, and he appeared to be the first retiree. However, on Lap 152, the crew got #30 back on track, 29 laps behind. And, just like last Sunday at Chicagoland, all 40 cars were still running. 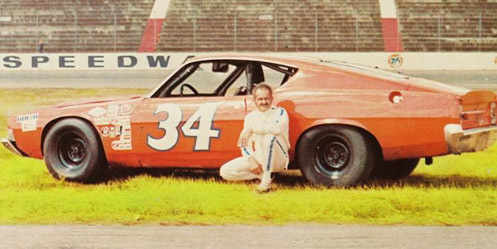 Annett did not enter the picture until Lap 240, when his #46 slapped the wall in Turn 2, drawing the third yellow. 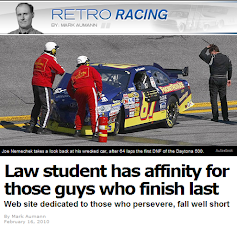 At first, the damage didn’t appear serious, but the HScott team pulled Anett behind the wall. Already running laps down around 36th at the time of the accident, the team decided to call it a day, citing steering issues. By 38 to go, NBC Sports listed Annett as the first car out of the race. 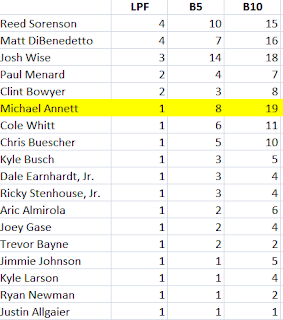 Seven circuits later, with just 31 to go, Annett slipped beneath Wise, finally ending the last-place battle. Wise ended up 39th. 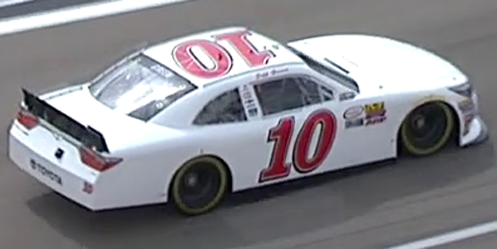 38th went to the afternoon’s only other retiree, Darlington last-placer Trevor Bayne. On Lap 286, Bayne’s #6 AdvoCare Ford lost control in Turn 4 and backed into the wall hard, drawing the fifth of the day’s six cautions. 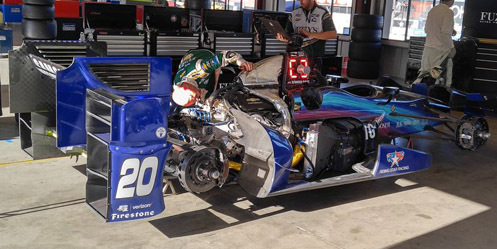 Unable to move the car with severe damage to the rear clip and right-rear wheel assembly, Bayne was done for the afternoon. 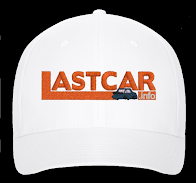 Jeffrey Earnhardt ended up 37th, 10 laps down to race winner Kevin Harvick. 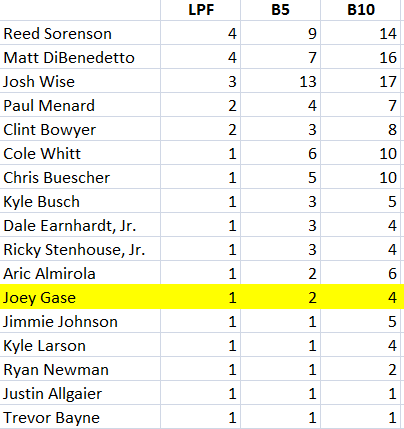 36th went to Reed Sorenson, who spun his #55 Vydox Plus Toyota to avoid the spinning Ricky Stenhouse, Jr. in the day’s final caution. 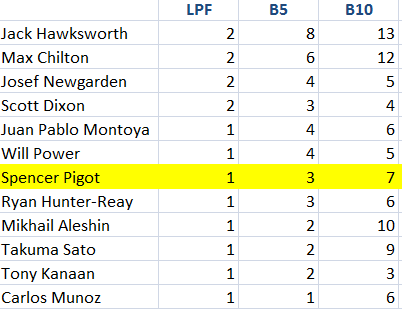 *The 236 laps completed by Annett were the second-most by a last-placer at Loudon in Cup Series history. The series record remains Brian Vickers’ 265 laps complete in the Sylvania 300 on September 16, 2007. Vickers and the other 42 starters finished the race under power, marking the first time an entire Cup field was running at the finish since October 1, 1995, when all 36 starters completed the Tyson Holly Farms 400 at North Wilkesboro. *This marked Annett’s first last-place finish in a Cup race at Loudon. *This was the first time the #46 finished last in a Cup Series race at Loudon since September 19, 2010, when Michael McDowell’s #46 Cash America Dodge lost the engine after 29 laps of the Sylvania 300. 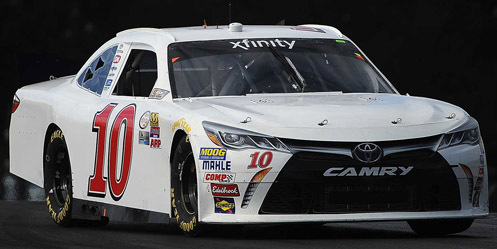 Matt DiBenedetto picked up the 12th last-place finish of his NASCAR XFINITY Series career in Friday’s Virginia 529 College Savings 250 at the Richmond International Raceway when his unsponsored #10 TriStar Motorsports Toyota fell out with a vibration after he completed 4 of 250 laps. 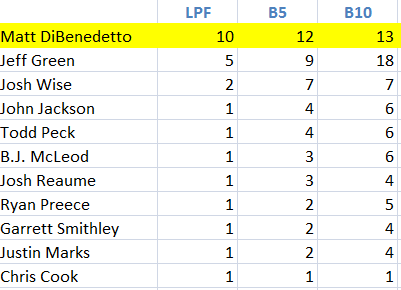 The finish, which came in DiBenedetto’s 62nd series start, was his tenth of the season, second in a row, and third in the last four races. DiBenedetto returned to Richmond for another double-duty weekend, but with a single twist: for the first time since the Daytona 500, he would have to qualify for Saturday’s Sprint Cup race on speed, having switched rides with newcomer Dylan Lupton. 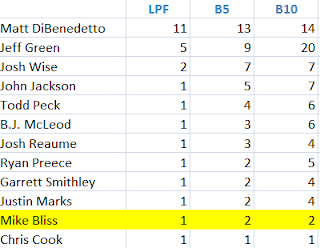 Once again, DiBenedetto rose to the occasion. 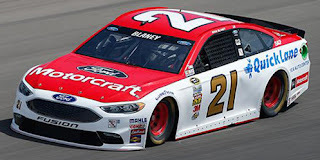 He qualified 25th for the Cup race, and after a 37th-place run in XFINITY practice, vaulted to 12th in Round 1 of XFINITY qualifying with a lap of 119.090mph. DiBenedetto sat out Round 2 and instead settled for a 24th starting spot on Friday. 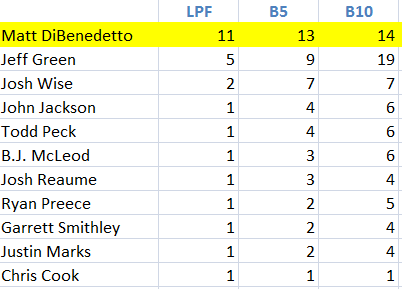 DiBenedetto was one of 43 drivers on the preliminary entry list, which again was whittled down by race day. First to withdraw was King Autosport’s second team, the #92 Chevrolet to be driven by Dexter Bean. 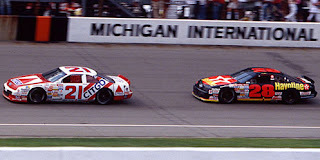 Then two more drivers failed to qualify, both in black Chevrolets: Morgan Shepherd in his #89 and the second Vroom! Brands #77 of Austin Theriault. Theriault was one of a number of drivers to find trouble in practice, his car making contact with the outside wall. 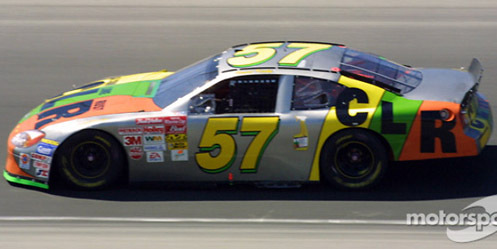 That same session, Chris Cockrum was forced to a backup car after a wreck in his #25 Lily Trucking Chevrolet for Rick Ware Racing. The Obaika team worked out a deal with Ware for Theriault to drive in place of Cockrum in the #25, which did not complete a qualifying lap and ended up starting 40th and last in the field. 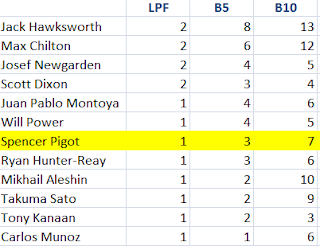 Through the first caution on Lap 50, three of the Bottom Five drivers pulled out of the race. 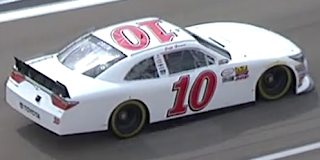 DiBenedetto parked the #10 after four laps, followed by Timmy Hill in Motorsports Business Management’s #40 Taiga Coolers Dodge. 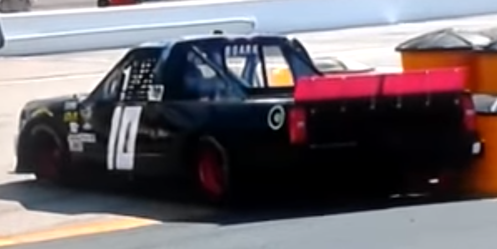 Mike Harmon, the third of this group, had an oil leak on his own unsponsored #74 Dodge during that first caution and wound up 38th. 37th went to Theriault, his Chevrolet overheating after 84 circuits. Rounding out the group was 27-year-old Alli Owens, whose XFINITY Series debut ended with a busted clutch on her #97 Obaika Racing Chevrolet. 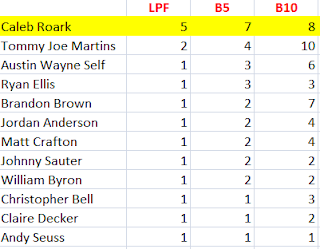 These were the only five DNFs of the race. In Saturday’s Cup race, DiBenedetto finished 37th. *This was TriStar Motorsports’ sixth last-place finish in the previous ten XFINITY races at Richmond.